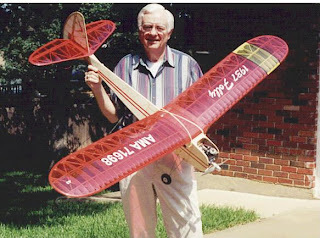 As most of you know, I have been building and flying model airplanes most of my life. 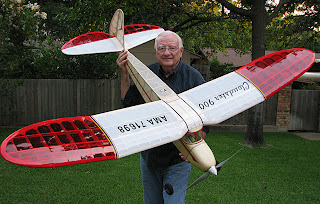 After I got a digital camera, I started documenting my model airplane construction projects by taking pictures of my work at various stages of construction as I went along. Then I started adding some descriptive narrative to the pictures, which ultimately became a sort of informal progress report that I e-mailed out to a few of my close modeling friends. The distribution of these reports quickly grew as I begin to receive requests from modelers all over the country as well as abroad to be put on my distribution list. Since I do not consider any of my work proprietary, the reports of several of my past projects have been collected and posted on other web sites, including the official Society of Antique Modelers (SAM) web site. Recently, I approached our grandson (Steve) who graduated from Texas A&M in Computer Science Engineering this year, to helped me set up a simple web site that I could use to share my work with other modelers. For a guy like Steve, almost anything is possible on the computer and in a very sort time he had developed a preliminary web site for me. We still have a few features that need to be worked out, especially with posting all of the reports of previous projects, so it is a work in progress at the present and will continue to be for some time. I have begun work on my latest project for the new SAM Electric Scale Duration event using a 6 volt Speed 400 canned electric motor. I am building a scale model of the 1941 Piper J-4E Cub Coupe shown below with a 49 inch wing span and 330 sq. in. wing area. Its beautiful vintage lines makes it an ideal candidate for the new SAM Scale Duration event. So far I have written and posted nine (9) progress reports relative to the construction of this model, which are under the category of (Projects). Some additional material has also been posted under the categories of (About Tandy, Pictures, and History). Cureently there is nothing under Articles. You can visit my web site by going to http://tandyw.byethost31.com/ . After you have had a chance to visit the site, I would appreciate any comments you might have. What has happened to Tandy's other WEB site? 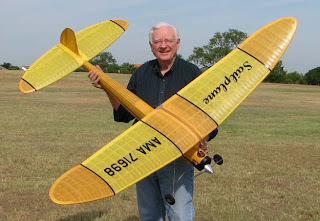 (http://tandysmodelplanes.com/) There doesn't seem to be any activity on it since September!